The wallets come in two different sizes. Materials include leather and zebra/cowhide/springbok hide or ostrich shin leather (leather taken from ostrich leg). Belts are made out of leather. 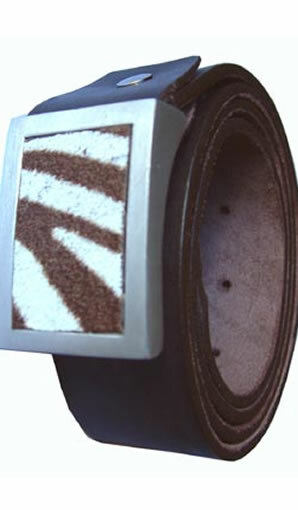 The inlay of the buckles are again eather zebra/cowhide/springbok hoder or ostrich shin leather. Our range of wallets consists of nguni cowhide, ostrich shin or zebra wallets, available in 2 different sizes.